The “FirnCover,” project team will install a network of instruments and take direct samples of how Greenland's snow and subsurface firn are responding to a rapidly changing climate. Snowmobiles pulling cargo on sleds. Photo courtesy Babis Charalampidis, ACT 2013. The science team arrived at KAN-U yesterday afternoon after weather conditions had improved enough for a safe snowmobile traverse. The traverse took about 4-5 hours and is located NW of DYE-2. 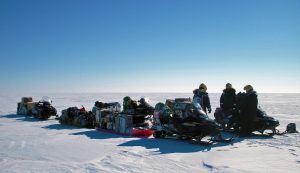 They have a lot of work scheduled at this location including ice core drilling, installation of weather stations and GPS units which will take at least two days as long as the unpredictable weather cooperates! Make sure to to follow their progress on the Ice Sheet here. 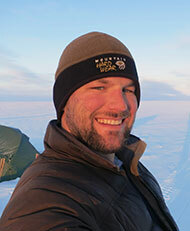 Join CIRES PhD researcher Mike MacFerrin and the rest of the international FirnCover team on a five-week snowmobile and airplane traverse across the Greenland ice sheet. Follow the FirnCover team as they camp in subzero temperatures and hurricane force winds in order to measure changes in Greenland's high-elevation snow and firn, while crossing one of the most beautiful, remote and unforgiving landscapes on Earth.